Cupping (sometimes referred to as ‘vacuum massage’) is an ancient Chinese method of causing local congestion. A partial vacuum is created in cups (either glass or plastic) when placed on the skin, either by means of heat or suction. This practice draws up the underlying tissues, and when left in place on the skin for a few minutes, blood stasis is formed and localized healing takes place. Cupping therapy has been further developed as a means to open the ‘Meridians’ of the body. Meridians are the channels through which energy flows to every part of the body; every organ and tissue. 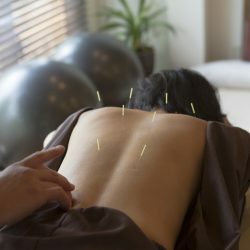 There are five meridians on the back that, when opened, allow revitalizing energy to travel the whole length of the body. Cupping is probably the best way of opening these meridians. Cupping has also been found to have an effect on the body up to four inches into the tissues; causing tissues to release toxins, activate the lymphatic system, clear colon blockages; help activate and clear the veins, arteries and capillaries; activate the skin; clear stretch marks and improve varicose veins. Cupping, the technique, is very useful and very safe. It can however, cause some swelling and bruising on the skin. As the skin under a cup is drawn up, the blood vessels at the surface of the skin expand. This may result in small, circular bruises on the areas where the cups were applied. These bruises are usually painless, and disappear within a few days of treatment. Cupping should not be used on you if you have: areas of skin which are inflamed; a high fever; convulsions or cramping; easy bleeding; or if you are pregnant. Should you have any questions about getting a Cupping treatment with us, please call us at 403-452-7899, email us here, or drop by our Panorama Hills location. We would be happy to consult you on your needs. Know someone who would benefit from a cupping treatment?